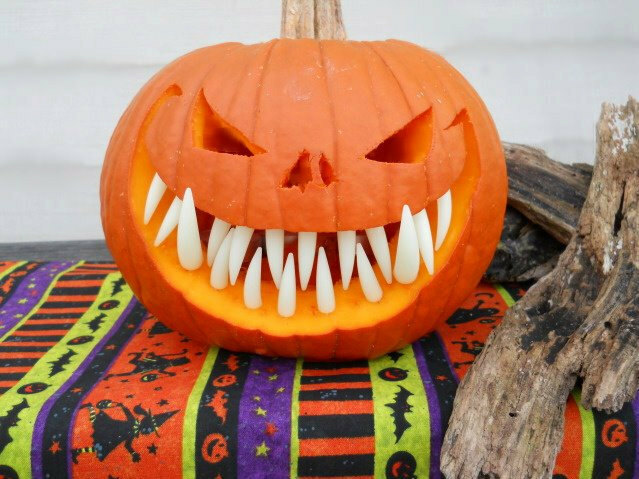 Give You Pumpkins A Little Extra Bite With Fake Fangs | OhGizmo! If you’re worried that your pumpkin looks a little more goofy than intended now you can turn up the spook factor with razor sharp vampire-like teeth. They’re little pieces of plastic that, as you’d expect, and can be embedded into your pumpkin to make it look much scarier. They come with large, medium and small teeth, but mark my words, the smallest pumpkins with giant fangs will be the most nightmare-inducing. They’re available on Etsy for $7 for 3 sets of teeth. But what do you do once Halloweens over, I guess you could always stick some teeth into your fruit bowl and have the orange look like it’s eating the banana, that’s pretty scary.